For anyone who has followed this blog from the beginning, you may remember this post from February 2016. In it, I make mention of my plans to acquire a garden plot as soon as the opportunity presents itself. From that time to this, I didn't hear a whisper but, when it comes to things of this nature, I am a patient being. I recently reached out to the director of the community garden and left a voicemail, asking where I might be on the list at this point. Several days later, I got a reply. Patience is a virtue. So, there I am in my kitchen, making a carrot cake from scratch when the call comes in. Thinking at first that it was a Robocall, I barely glanced up at my phone and was shocked to see the name I'd been longing to see emblazoned across my phone's screen. Finally, the call that I'd been waiting for. With alacrity, I seized the device and tapped the screen to answer. After an exchanging of pleasantries and an apology from her for the long wait, she got down to business and informed me that they were preparing the site for growing this year. She explained that last year's garden didn't do so well due to the All-Encompassing-Almighty-Deluge we experienced in the form of rain. For an idea of the amount of rain that this area got, look up Ellicott City or Baltimore and Flooding. So, I was asked to prepare for another call within the next few weeks. I'm guessing that's when I sign papers and get the key to the garden gate. I hope anyway. For all I know, I might have to write a two hundred page thesis on the intricacies of horticultural development in human civilization over the past fifteen thousand years before I'm approved. Semi-recently, I ordered ten Crocus bulbs from a gardening catalog but had to wait for them to finish growing...I guess before they could be shipped to me late in September. Guess what just came in the mail yesterday. Surprising my postal worker with my sickly chic pajama'd fashion sense, I awkwardly sashayed my way over to my mailbox and announced that I was expecting a package of Crocus bulbs from the given seed company. The Postal Workers on my route are so cool. Completely unperturbed by my get up, he handed me my box and wished me well. From there the panic set in. I wasn't expecting the package until Friday and hadn't been to the local box store for potting mix yet. So I let my fingers do the walking on my keyboard and after much research, I put my newly acquired bulbs in the refrigerator away from any fruits and veggies until I could get to the aforementioned box store for the said potting mix. Once I get the needed supplies, I'm planning on planting the bulbs in a couple of small containers before putting them in my window. They should add some nice color to my room. In addition to this, I also have another third of the seed/bulb order growing up in the Aerogarden. The Patio Choice Tomatoes have been thinned and despite a partial power outage of four days, they are doing very well for themselves. About the only other thing I need to get on top of is the epic saga repotting of my potted plants. The oldest of which is twenty-one years old and nearly as tall as I am. I appear to be stuck. Mainly due to the heat. It has been far too hot to even think, let alone knit or garden recently. I've gotten by maintaining a watering schedule for my houseplants (which all need repotting) and Aerogarden. Sadly, this has meant that just about everything else has gone by the wayside, including knitting. Not for much longer though. I'm determined to power through on this project so I can get to making my gloves and hat/scarf set for myself. I've put myself off for years and now is the time for me to get something nice. In the realm of plants, say farewell to the Basils and the Spearmint. I am sending them off to pine for the Fjords. You see, they've been taking advantage of the near 100F weather we've been having recently by growing abundantly. Under normal circumstances, I'd be happy about this. Not right now though. I am Basil'd out. In their place will be some yellow tomatoes. This will mark the first time that I will grow both yellow and determinate tomatoes. I finished my Flax sweater! 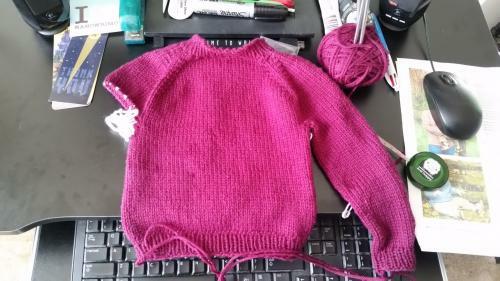 This sweater took me from 26 August 2017 to 1 July 2018 to knit. I have such a sense of accomplishment right now. However, now I have the burning desire to knit this sweater. Even though it is completed. I will just have to get a crocheted project to shake off the urge to knit upon waking. My plants are all doing well. I actually have to trim the basils back...again. It is said that Basil is the King of Herbs. It certainly rules around here lately. 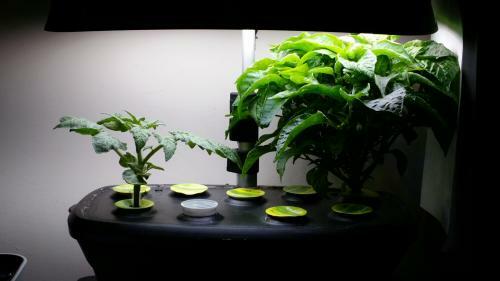 I have three varieties growing in my Aerogarden. 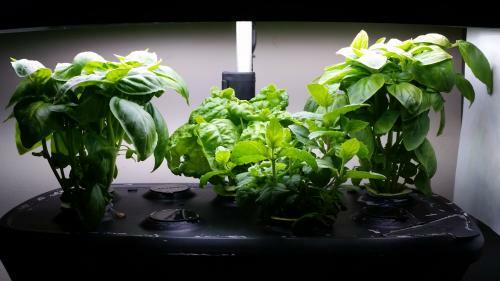 Cinnamon Basil, Lettuce Leaf Basil, and Large Leaf Italian Basil. 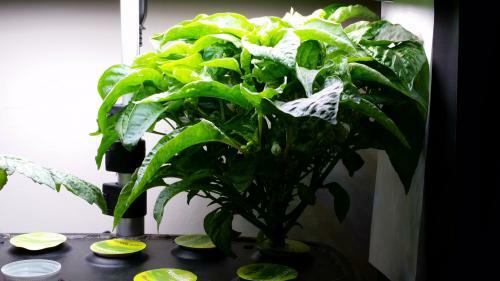 In addition to this, I have some Spearmint growing in the Aerogarden as well. 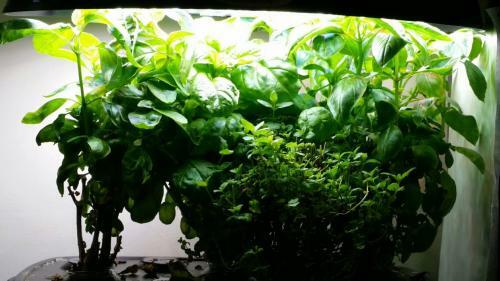 I could have filled this void with yet more basil but I figured I'd try something different in the Aerogarden even if only to break up the monopoly the basils had. The Spearmint grows incredibly fast and easily holds its own against the three Basils. 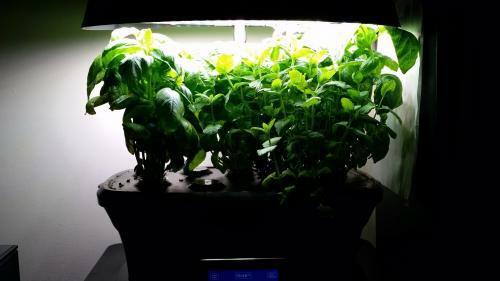 Though I do have to keep the Lettuce Leaf Basil trimmed to keep it from blocking the light. 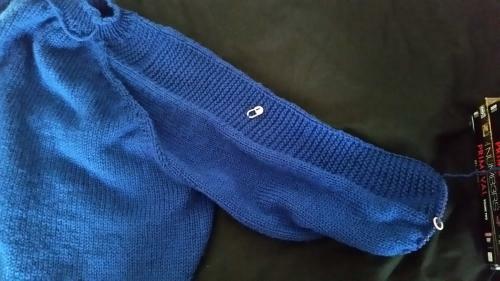 For anyone curious about the sweater I posted about previously, I am currently working on the sleeves of my blue Flax sweater, Mir Ist Kalt. In this stifling heat, it is not the most fun of tasks but it is worth it to see the stitches getting done round by round as my garment edges closer and closer to completion. 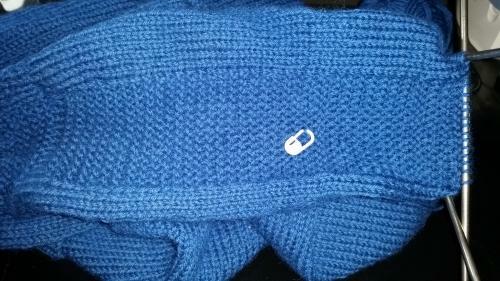 I have made some progress with the Mir Ist Kalt sweater. I am a mere inch and a half from closing the body of the sweater out. From there, I'll start the sleeves. On the plant front, I am ripening a whole container of Mega Cherry Tomatoes. This is my first full harvest of the year and it looks to be a good one. At first, I thought the tomatoes weren't going to turn but they once again astounded me with their amazing abilities. 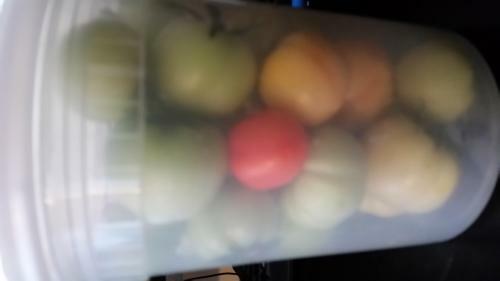 From full-on green, they began to take on the familiar rosy color of a blushing ripening tomato fruit. Now one is all but completely red while the others are fast approaching the same color. Just a quick post. I hope everyone is doing well and having a happy time. I've finally cut that freakishly long/tall leaf from my Snake Plant. Now that it is separated from the parent plant, I'm going to cut it up, dip it in rooting hormone, pot it all, and hope for the best. I am also giving one of the Pineapple plant babies away. The larger they get, the more I realize that I can only sustain one. So, one is going to one of the secretaries at one of the doctor's offices I go to regularly. I get the feeling that she'll not take care of it the way I have and I'm bracing myself for being a witness to this. So, we'll see. In the non-plant news, I am making a sweater. 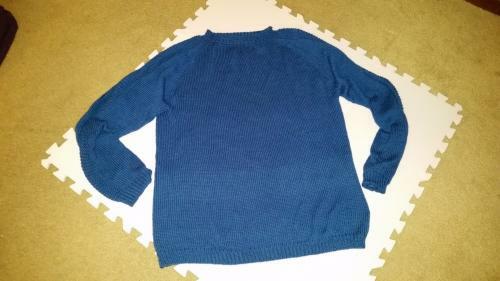 It is a pattern called the Flax Sweater by a knitting duo called Tin Can Knits. The working name I'm giving my variation is "Mir Ist Kalt" due to my wanting to practice German as well as it being super cold in this house due to having to deal with the dueling banjos of the air conditioner during the Summer months when I first conceived of making this sweater. Two people were vying to make it as cold as humanly possible in this house without consulting with the third person, that person being me. 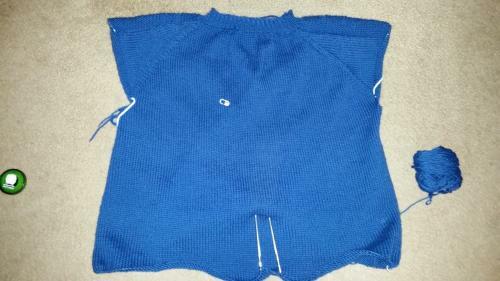 It is a top-down Raglan, made with TARDIS blue yarn. The yarn I'm using is Knit Picks - Wool of the Andes Worsted in the colorway Winter Night. 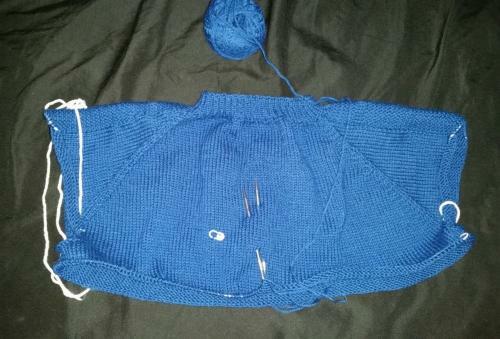 Thus far, I have knit enough to where I am in the round and knitting the body of the sweater. I have yet to try anything on yet. About the only other thing happening during this Halloween-mas is a sudden fruit bonanza on my Sweet Pickle Organic Pepper plant. Meh. So, I am in perpetual wait mode for the community garden plot. While I am sitting here, I figured I might as well get some crocheting and other things done in the meantime. I planted the 'Lettuce Leaf' variety of Basil. That's just starting to come up. All the other plants, the Pineapples, Peppers, Tomatoes, etc are self-sustaining with very little input from me. Months ago, I also started an Avocado pit. That's now growing beautifully in a pot, on my windowsill. The Snake plant now rivals me in height. The Spider plant is growing out of the pot. So, twiddling my thumbs about what to do, I decided to crochet something I haven't worked on since December 2016. 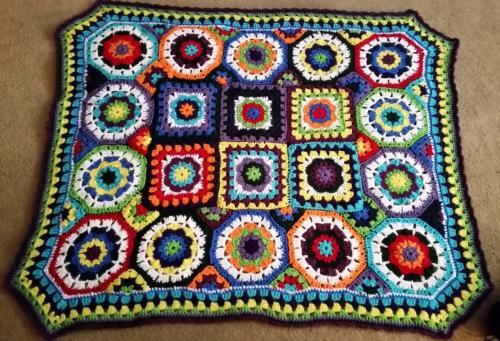 This is the In Love With Color Throw designed by Jessie Rayot. It took me ages to finish piecing this together and putting the border on. Now, everyone is laying claim to it/offering to buy it off of me. Currently, I have two babies growing in my Aerogarden of Serendipity. One is a new pod of an old friend. The Mega Cherry Tomato, unfortunately, had to replace the third pod due to the failure of the seeds in the originally installed pod to germinate. I think they may just have been too old or not mature enough or something like that. The other plant taking up space is a wild card. 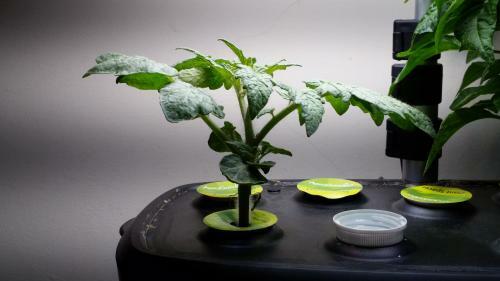 It is, even now, an unknown variable within the workings of the Aerogarden. 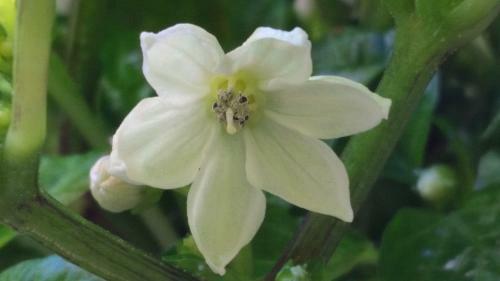 The Sweet Pickle Organic Pepper plant has been growing the longest in the Aerogarden and is already at the point where it is blooming profusely. For my part, I haven't been up to much stuff that's plant related. Just re-potting the pineapples and starting some Avocados. Still waiting on the Not So Secret Garden plot to become available. Hopefully, something will come through soon. As much as my Asthma and Allergies are averse to being around such places, I could do with the extra growing space for food. Especially now. Thank you for reading. Take care and be well.